This HeadBlade TripleBlade Replacement Kit features 4 double-edge blades with lubricated strips and 2 adaptors. Compatible with the Classic and Sport Scalp Razors this kit is essential for providing peak HeadBlade performance. 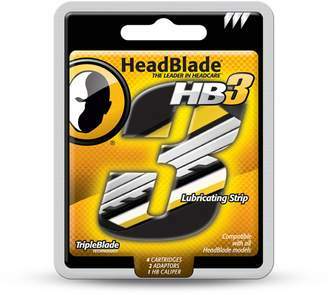 HeadBlade is proud to introduce their newest, most technologically advanced blade ever; the HeadBlade Triple. Made using a Micro Tilted Grinding System coated with micro thin film, the HeadBlade Triple gives the smoothest head shave possible. This 4 blade kit includes a Caliper (which makes getting the blades out of the protective tray easy) and also comes with 2 adaptors that will last 6 months to a year depending on how much tension you prefer on the blade. This kit includes the following products: 4 Lubricated TripleBlade Cartridges. 2 Replacement Adaptors. 1 HeadBlade Caliper. 1 HeadBlade Owners Manual.